It is hard to believe that when I read House of Chains, I was so far ahead of the curve that Tor had only published the first book in the series so far, and I was still buying Orbit copies, usually from amazon.co.uk. And yet now, thirteen years later, I still haven’t finished the series yet. On the bright side, that’s what this is all about, innit? Since I have read this one, yep, audiobook. And they changed performers! I’m extremely torn here. Unlike what the reviewers on Audible’s House of Chains page will tell you, Michael Page is not terrible. He’s not quite as good as Ralph Lister from a range perspective, but at least he pauses for half a second between point of view character breaks in the text, instead of reading onward like an automaton regardless of the tonal / plot differences that should be apparent right then, not 30 seconds later when I finally figure out what just happened. On the downside, Lister pronounced everything exactly the way I always have, whereas Page is wonky on some of the names (which could be a difference of opinion) and on some of the terms (which 100% could not be; Soletaken is not pronounced sole-uh-tawk-en, and I will die on that hill). It’s an unfortunate trade-off, even though I think I like the pacing correction more than I dislike the other bits. Spoilers from here on, I reckon, since this is after all a reread. As for the story, well, as usual having familiarity has helped this reread a lot. Like, obviously I have consistently loved the characters and the unfolding narrative alike, but there’s something comforting about being able to nod and understand what’s happening, instead of trying to keep my head above water. This book was better about that the last time too, mostly, but still. Except for the opening section, in which brand new characters almost entirely unrelated to anything that has gone before showed up, but I think to some degree the series will end up being Karsa Orlong’s story as much as it is any individual’s (him, and house Paran at large), so it was good to introduce him as dramatically as he was. But man, the house Paran bits. Like, that is a seriously dysfunctional family, and I suppose I wonder if anyone but Felisin will ever know what happened to Felisin. I know it’s right there in the title, but I am regularly surprised by how much of this series is a tragedy. Well, no, that’s not it. I’m surprised that it’s a tragedy on a human scale every bit as much as it’s a tragedy on a historical scale. (A massively historical scale, frankly.) Usually these kinds of things are historically tragic, but the characters being written about are mostly exempt. Last thing, and this I really don’t think I understand. Fiddler in the first two books was basically the baby of the Bridgeburners, and seemed like he was somewhere between 16 and 20 the way he was described. Yet here, probably less than a year after Deadhouse Gates, he’s described as a grizzled veteran and seems like he’s in his 40s, minimum. I must be misunderstanding something, but damned if I can figure out what part. Anyway, yeah. I’m still enjoying this listen-through very much. 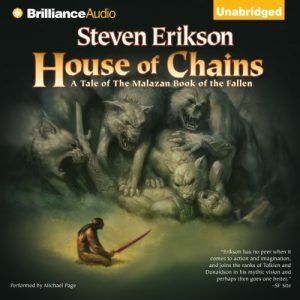 This entry was posted in Words and tagged audiobook, epic fantasy, The Malazan Book of the Fallen on July 3, 2018 by Chris.